Today, it gives me great pleasure to bring you another dear cyber friend, whom I just met in person. I was so excited that I got to meet her and several other cyber-writer friends at the ACFW (American Christian Fiction Writers) conference. This piece in our Behave Like a Christian series is written by Linda Yezak. I urge you to hop on over to her site 777 Peppermint Place and the site where she contributes the rest of her time AuthorCulture. As he told us about his father’s death, Bro. Paul continued to smile, and I went through three Kleenexes. I was weeping while he rejoiced over his father’s entry into heaven, but inwardly, I rejoiced with him, just as he was probably weeping inwardly. How odd that Saint Paul would have to tell the Christians of Rome to rejoice and weep with their family in Christ. You’d think that would come naturally. For me, the weeping part is no problem whatsoever. Truvy in Steel Magnolias said it for me: “I have a strict policy that no one cries alone in my presence.” I cry easily and at the silliest things, so you can imagine how I was blubbering at Bro. Paul’s announcement. 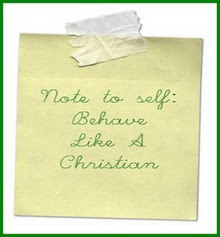 The entire passage Lynn chose for her guest post extravaganza is a lesson on how to behave as a Christian. This verse in particular teaches us how to love our family in Christ—which is all rejoicing and weeping are, showing our brothers and sisters that we love them and care about their lives. This shouldn’t have to be taught—or should it? Have we become so self-absorbed that we don’t notice those of our members who are hurt, going through a rough time, or lost? When a member of our family asks for prayers on Sunday, do we pray for them during the week? Not everyone steps to the front of the church for prayers when the invitation is offered. Do we look at those around us, read expressions, notice those who are in silent pain? Do we let petty jealousies prevent us from celebrating with those who have reason to rejoice? Do we mock those whose accomplishments seem petty? Do we consider people who dare to mention their achievements arrogant? Do we consider it our responsibility to “knock them down a peg or two”? I’m ashamed to admit that I don’t always notice those who may need a kind word, and I do tend to feel jealous when someone has achieved something that I long for. I’ve become far more self-absorbed as my daily life increases in busyness. He’s not requiring us to lay down our lives. He just wants us to love each other, celebrate with each other, have sympathy for each other. This requires interaction on our part, and it requires us to put someone else’s needs higher than our own. Boiled down to their simplest forms, the tenets of our faith are to believe in Christ, love God, love everyone else. By loving everyone else, we’re showing we are Christians and we’re showing God our love for Him. How easy it should be: Rejoice with those who rejoice, weep with those who weep. The guest post is inspiring, as always. I have a present for you, but you need to go visit my blog to claim it! I enjoyed this post encouraging believers in Christ to rejoice and weep when called upon. I sadly admit, there have been those selfish times when I’ve weeped when I should have rejoiced and rejoiced when I needed to weep, but I too am being taught of the awesome price God paid for me; it’s value is truly priceless. Hey, Sweet Lynn! Thank you for hosting this extravaganza and allowing me to contribute to it. How wonderful it was to finally get to meet you! I’ll treasure that forever!!! Great post. Yesterday was the first anniversary of my grandfather’s death. My grandmother followed him a few months later, so this past year has been one in which there has been both a lot of weeping and lot of rejoicing. God knew what He was doing: it really is a wonderful balance! What a thought-provoking to make one think the next time we are sitting in the pew or even in our daily lives, “How would others want us to pray for them during those times we feel our cares are insignificant or not as important as perhaps another person’s struggles?” I believe your answer was very insightful– “to look around us, read expressions, notice those who are in silent pain.” Thanks for sharing! Katie–sorry for your double loss! How wonderful to know that you’ll see them again.